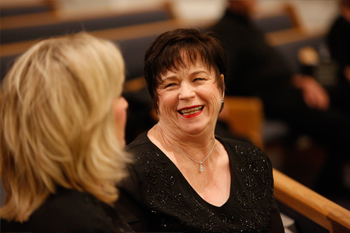 Under the direction of Raymond P. Woods, South Coast Singers is a dynamic choral group made up of more than 40 choral musicians from South Orange County, California. They are proud to carry on their tradition of presenting “people-pleasing music” at concerts in June and December. Drawing audiences from all over Orange County and beyond, the Singers perform at local community and civic events, and are available for private bookings. To schedule an audition, please send an inquiry to info@southcoastsingers.org and the Audition Coordinator will contact you with an appointment time. In preparation for the June concerts, auditions are generally held in mid-February; the fall session auditions are usually scheduled for mid-August. If you are interested in becoming a member of the South Coast Singers, you will need to schedule an appointment for an audition. The atmosphere is very friendly and the process is an opportunity for the director to meet you, hear your voice, and explore your skill with sight-reading. Sight-reading is done with accompaniment and the director will be looking for your ability to read your part in a choral piece. Rhythm is important and there may also be a test for tonal memory (ie., the ability to sing a phrase after hearing it played on the piano). You may also be asked to pick out the middle note in a three-note cord. You may prepare one song for the audition. Choose a song that is “pops” in nature – jazz, swing, pop, Broadway, blues, standards, Latin, etc. You can use your music during the audition and there will be an accompanist; please bring a second copy of your music for the pianist. If you have not prepared a song, then the director will play a simple, well-known tune and ask you to sing along. Prior to your audition, you will receive a form asking for your singing experience; please bring that form to your audition. The audition process takes about 5-10 minutes per person, and is held in the choir room (the outside door to the left of the main entrance) at Dana Hills High School, 33333 Golden Lantern, Dana Point. Other candidates may be present to view your audition. Although musical and vocal abilities are certainly important as a singer with South Coast Singers, you do not need to have a voice of professional, solo quality in order to be a valuable member of the group. If you feel you could contribute your talents, you are encouraged to audition. However, rehearsals are fast-paced and singers are expected to spend time between rehearsals working on difficult passages; downloadable mp3 rehearsal recordings are available on the Members Only section of this website that will aid in that self-study. Typically, the South Coast Singers has a concert schedule that includes three performances in June and three holiday performances in December. Rehearsals begin the first Tuesday in March and the Tuesday following Labor Day in September. Singers are asked to commit to being available for all concerts. Rehearsals take place every Tuesday evening from 7 – 9 pm at Dana Hills High School in Dana Point. Occasionally a sectional may be held as part of the regular rehearsal or as an extension of a regular rehearsal (9-9:30 pm.) There is a Saturday morning rehearsal once every season (usually about six weeks before the first performance) and two “dress” rehearsals (usually 6:30-9:30 pm) during the week prior to the first concert. As a nonprofit corporation, all South Coast Singers are considered corporation members. A membership/registration fee of $105 is paid at the beginning of each season (semi-annually) and new members must also pay a one-time refundable music deposit of $40 which covers the cost of any damaged or lost scores. This deposit is returned if the singer chooses to leave the group. All fees are subject to change. If cost is a concern, South Coast Singers will provide a contact within the organization with whom you can confidentially discuss your concerns. In order to present a unified, professional look, all singers wear concert attire for South Coast Singer concerts. Women must purchase the choir’s black skirt, blue and black tops, and necklace. The cost of these items is approximately $170. Ladies must provide their own black closed-toe shoes, black stockings, and earrings. Costume pieces and cost are subject to change. Men wear black dress shirts, black slacks, black dress shoes and socks, all of which they must purchase on their own. They will be asked to purchase ties which coordinate with the costumes worn by the women. Each tie is approximately $10. All singers must use black choral folders purchased through the group; cost is approximately $8. Purchasing of ties, ladies’ outfits, and music folders will be arranged through South Coast Singers; each individual member is required to reimburse the group for their items at time of delivery. Wardrobe items and fees are subject to change.